One of the delights of exploring the Mediterranean on a superyacht is the opportunity for wonderful dining. Some of the best restaurants in the area use simple techniques and local ingredients to produce stunning food. Here four Michelin-starred chefs — Marc Fosh, Fabio Bragagnolo, Giancarlo Morelli and Antonio Mellino — give their take on some of the best rustic restaurants in the Mediterranean. Fabio Bragagnolo says: “If you are prepared to leave the sea and have your feet on the ground for a day, it is worth heading into the Alta Rocca region in the heart of the island, with its dramatic mountains, forests and bronze-age megaliths. Levie is an hour from Porto-Vecchio (or 30 minutes from Propriano on the west coast) and A Pignata is an authentic farm inn that serves traditional Corsican cuisine: roast lamb, cannelloni with brocciu, flageolet casserole and beignets.” Need to know: The restaurant was opened in 1988 by Antoine and Lili de Rocca-Serra in the village where they were born. The beautiful open-air restaurant has a large fireplace and lovely views. 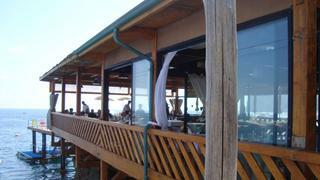 It is also popular with locals in the evening so it is worth booking a table. How to visit from your superyacht: If you decide to incorporate a visit to A Pignata while chartering a superyacht in Corsica or cruising on a private yacht, make sure you have accurate directions as it is easy to get lost on the narrow road leading to the farm. While you are on dry land you should consider visiting some of the country's vineyards as Corsica is a wine lover's paradise. One of the delights of exploring the Mediterranean on a superyacht is the opportunity for wonderful dining. Some of the best restaurants in the area use simple techniques and local ingredients to produce stunning food. Here four Michelin-starred chefs — Marc Fosh, Fabio Bragagnolo, Giancarlo Morelli and Antonio Mellino — give their take on some of the best rustic restaurants in the Mediterranean. 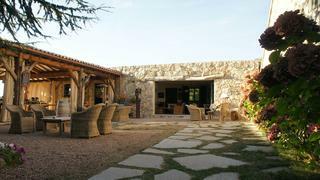 Need to know: The restaurant was opened in 1988 by Antoine and Lili de Rocca-Serra in the village where they were born. The beautiful open-air restaurant has a large fireplace and lovely views. 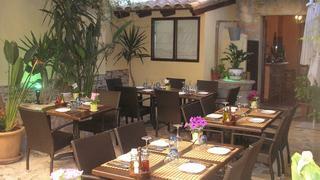 It is also popular with locals in the evening so it is worth booking a table. How to visit from your superyacht: If you decide to incorporate a visit to A Pignata while chartering a superyacht in Corsica or cruising on a private yacht, make sure you have accurate directions as it is easy to get lost on the narrow road leading to the farm. While you are on dry land you should consider visiting some of the country's vineyards as Corsica is a wine lover's paradise. Giancarlo Morelli says: “One of my favourite restaurants is 20 minutes inland from Porto Cervo, in San Pantaleo: Giagoni in Piazza. 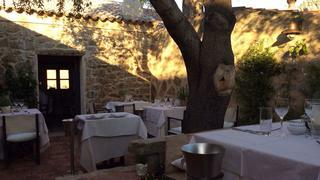 It’s a beautiful old stone house, which the Giagoni brothers have transformed into a restaurant. They serve Sardinian pasta specialities, such as culurgiones (potato- and mint-stuffed ravioli) and small, round sa fregula. They also serve arguably the best lobster on the island.” Need to know: The restaurant is in a typical stone house of Gallura and it overlooks the square of the church of San Pantaleo. It is open from March to November and if you don’t fancy supper you can just pop in just for an aperitif. How to visit from your superyacht: Giagoni in Piazza is in the small town of San Pantaleo which is less than 15km away from glitzy Porto Cervo. Home to the Loro Piana Superyacht Regatta, Porto Cervo marina draws a host of yachts for private cruises and for superyacht charters in Sardinia every summer and is also one of the top party destinations in the Mediterranean. Need to know: The restaurant is in a typical stone house of Gallura and it overlooks the square of the church of San Pantaleo. It is open from March to November and if you don’t fancy supper you can just pop in just for an aperitif. How to visit from your superyacht: Giagoni in Piazza is in the small town of San Pantaleo which is less than 15km away from glitzy Porto Cervo. Home to the Loro Piana Superyacht Regatta, Porto Cervo marina draws a host of yachts for private cruises and for superyacht charters in Sardinia every summer and is also one of the top party destinations in the Mediterranean. Marc Fosh says: “I live inland from Palma, near the vineyards, and there’s a place in a nearby village called Sa Cuina de n’Aina. We have very good lamb on the island and Aina roasts it in a clay oven – it’s delicious. I go there for arroz brut: rice cooked with stock, vegetables, local sausage and perhaps some rabbit or game; it is typical of traditional Mallorcan food, which is quite hearty.” Need to know: The restaurant is a family run affair. With the father (José González Haro) acting as director and supervisor, while his wife (Aina Carbonell) is the chef and their son (David González Carbonell), is the maître d'. David’s wife is also a cook and their daughter was awarded the national best young cook prize. How to visit from your superyacht: Sa Cuina de n’Aina is in the village of Sencelles, about a 30-minute drive from Marina Port de Mallorca, which has 45 berths for superyachts. Need to know: The restaurant is a family run affair. With the father (José González Haro) acting as director and supervisor, while his wife (Aina Carbonell) is the chef and their son (David González Carbonell), is the maître d'. David’s wife is also a cook and their daughter was awarded the national best young cook prize. How to visit from your superyacht: Sa Cuina de n’Aina is in the village of Sencelles, about a 30-minute drive from Marina Port de Mallorca, which has 45 berths for superyachts. Antonio Mellino says: “Our neighbour in Nerano, Lo Scoglio da Tommaso, down on the waterfront, has been there since the 1950s, run by the De Simone family. Peppino de Simone says he is a fisherman and farmer first and then a restaurateur. He cooks traditional dishes in which produce is respected.” Need to know: The restaurant is run alongside a small hotel and it trades on its family atmosphere. The place is filled with the children and grandchildren of the De Simone family. How to visti from your superyacht: Lo Scoglio da Tommaso is located right on the waterfront in Nerano. Depending on how close you anchor the restaurant has been known to serve guests on board. Nerano can be enjoyed as past of a private cruise or superacht charter on the Amalfi coast. Need to know: The restaurant is run alongside a small hotel and it trades on its family atmosphere. The place is filled with the children and grandchildren of the De Simone family. How to visti from your superyacht: Lo Scoglio da Tommaso is located right on the waterfront in Nerano. Depending on how close you anchor the restaurant has been known to serve guests on board. Nerano can be enjoyed as past of a private cruise or superacht charter on the Amalfi coast.